By December 15th of this year we’d not done one thing to prepare for the holidays. No light strung, no sweets made, no nothing really. We’d planned our second annual Festivus for the Rest of Us party—where decorations (and tinsel) are abhorred—but I knew the BFF was secretly hankering to bust out the Christmas boxes. “How about I make us a tree for the party,” I pose. She squealed. Gadora intended to repurpose the branches I’d witnessed her saw off a tree a few days earlier, saving them the fate of the trash can. 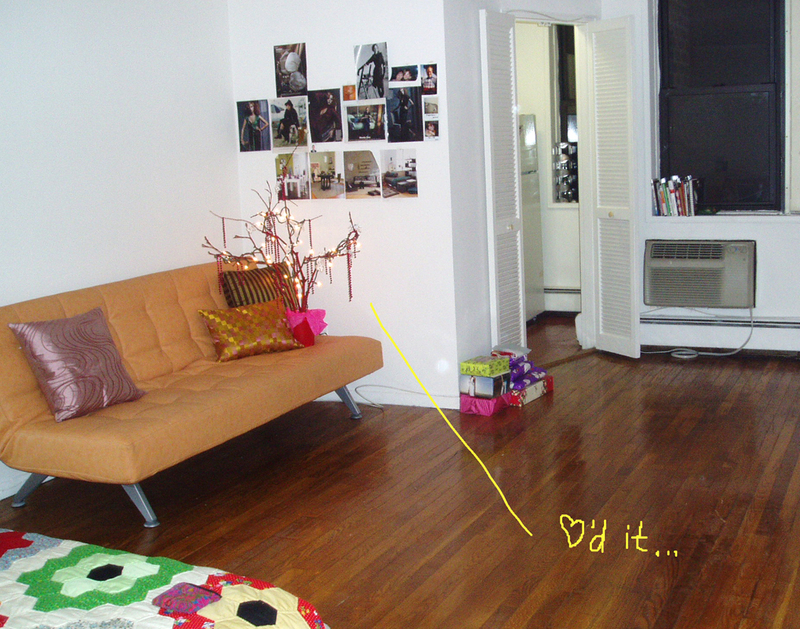 It would be our Zero Dollar Christmas Tree… no tree felled, we’d craft the ornaments ourselves and enjoy an evening with the girls while pulling it all together. 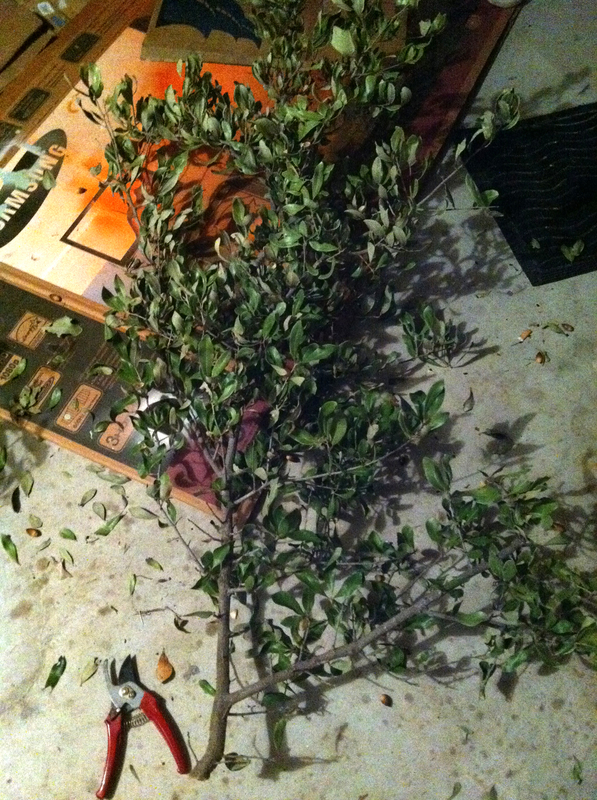 Armed with nothing more than a branch and yard clippers, we got to stripping. Took every last leaf off the branch, careful to leave the few acorn tops attached. This was the one branch we had to work with. Last week it taunted passers-by on the sidewalk, threatening to scratch them if they dare pass. And this week, it would adorn the bar. The biggest centerpiece ever. 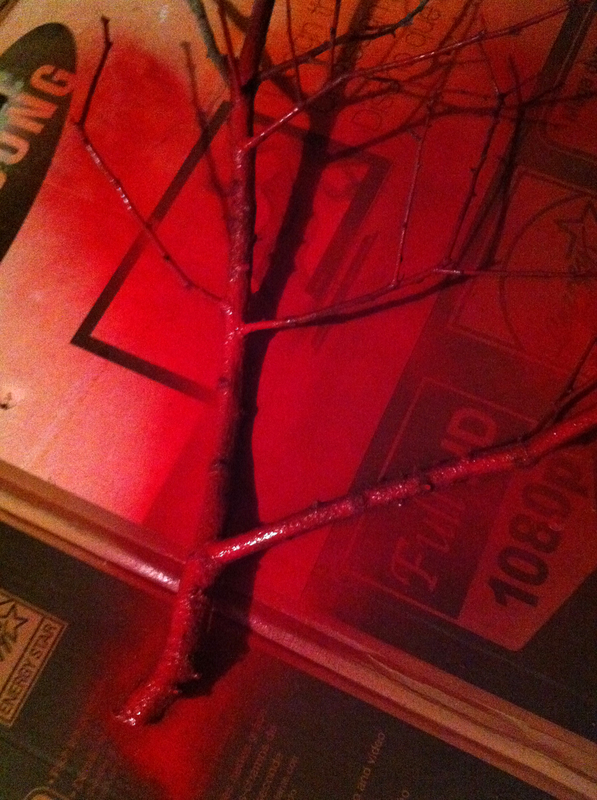 With the tree bare, we gave it a quick spray of red. We then searched the garage for a suitable base. 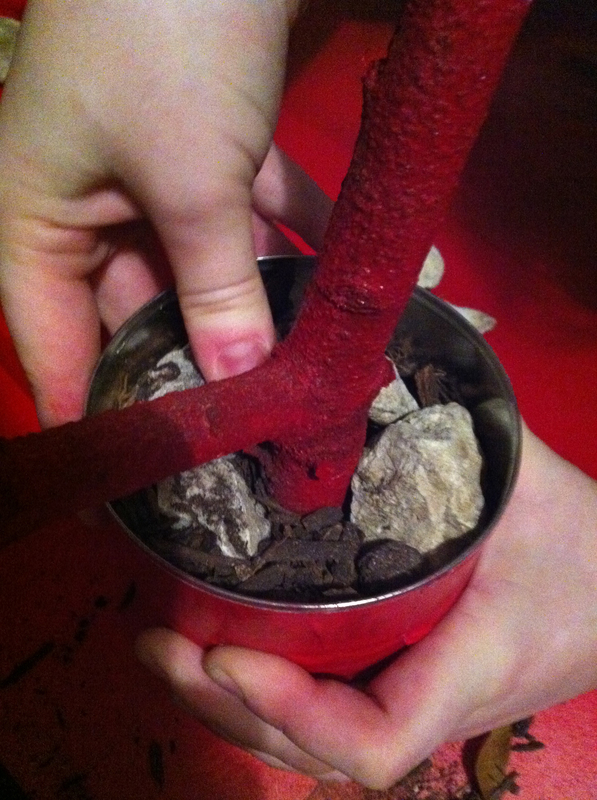 An empty coffee can, some rocks from the bed out front and dirt and water would do the trick. Took us a few tries to prop the tree at the proper angle, then fill and refill the coffee can with just the right mix of rocks and water. Having run out of spray paint, red duct tape was used to jolly up the can. And another. We delighted in the way each distinct way of cutting our own papers caused patterns of flurries to emerge. We each created such different flakes from one another, but yet our own cuts made a family of flakes that all resembled one another. We relished the Festivus miracle we witnessed with every unfolding flake. With the new tree firmly placed on the bar, we stood back to marvel at our crafty selves. We were proud. To glam it up, we added a few spindly gold stars and sparkling pears (yes technically these cost money… but they hadn’t been outside of their Christmas boxes in years, so we’ll call them ‘repurposed’). We made bets about how many times our tree would be knocked over at the Festivus. And I’m happy to report we all lost that bet. Nary a guest complained that we’d done a lil decorating for the Festivus. Charlie Brown would be proud. Festivus Web ~ Festivus quotes from Seinfeld. Lots of em. 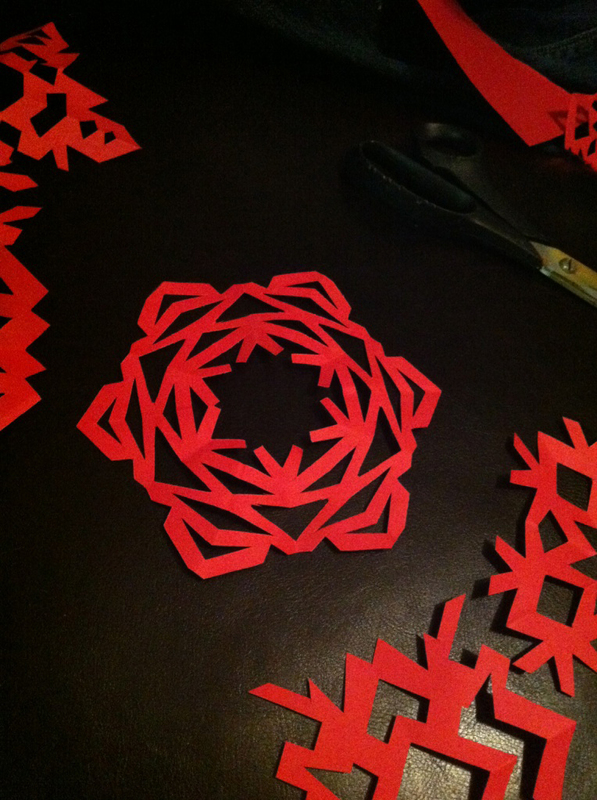 Paper Snowflakes ~ Templates for 6-sided flakes. 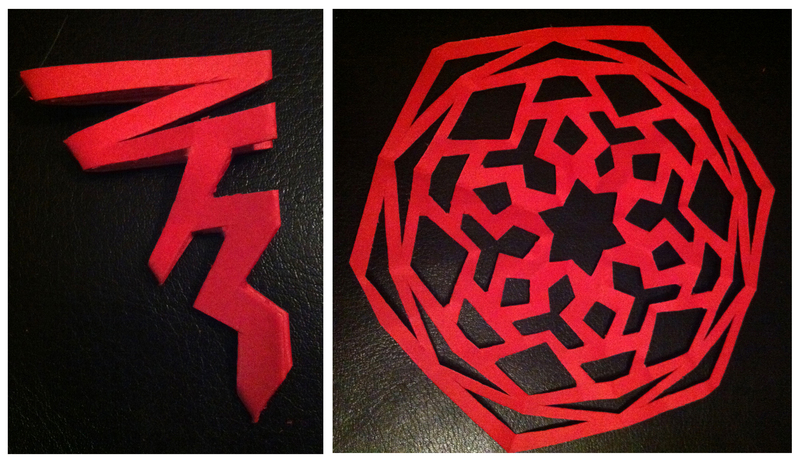 Wiki How ~ A step-by-step how to make a 3-D snowflake for yourself. Fancy. 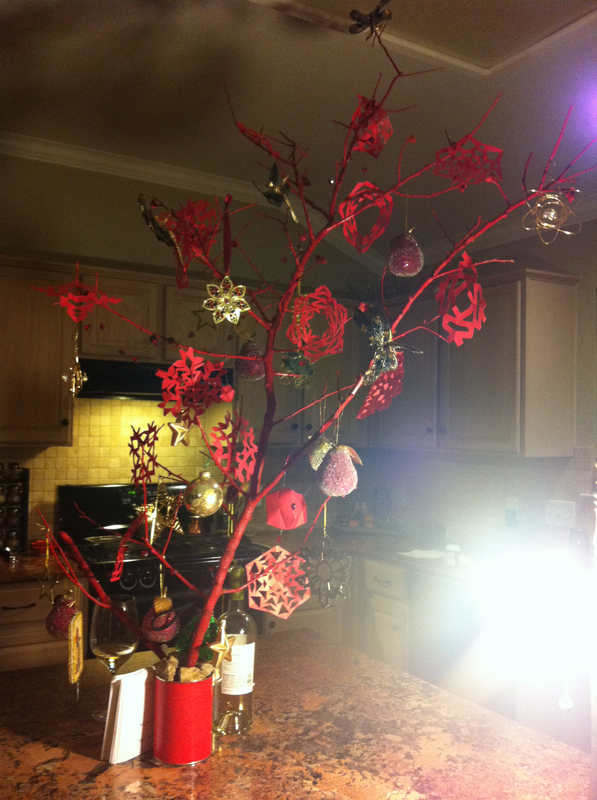 Posted on December 19, 2010 July 1, 2012 by gadorawilderPosted in Do-it-YourselfTagged Christmas tree, Do-it-Yourself, easy art project, Festivus, Festivus Pole, Martha Stewart, Shabby Chic, Snowflakes, Tree. You’re quite the remarkable woman. Loved it. showing mom how to write a comment on your blog – she thinks you’re so crafty! she wants you to come and fix one for her…. i’m heading back to cc tomorrow – come on down and make some sandcastles…. You make me laugh!! 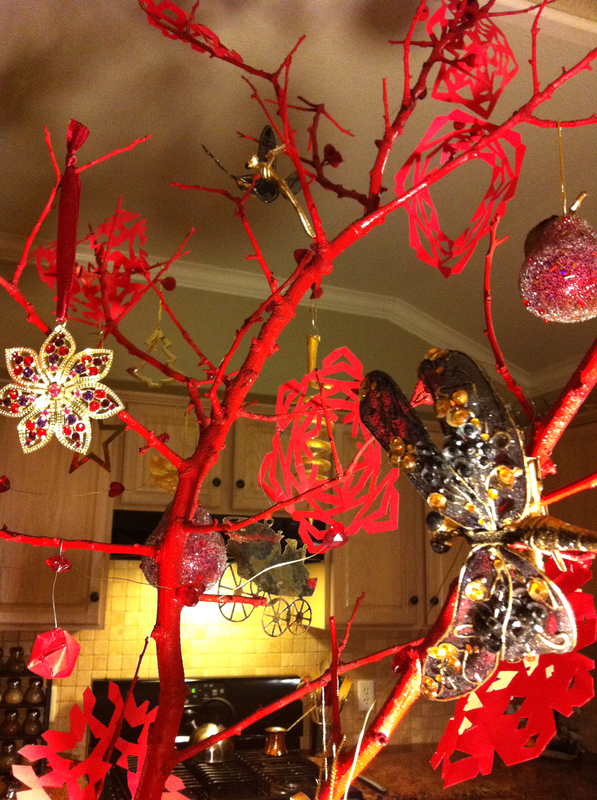 Cute and quirky tree – just like you and the BFF! Missing you for the holidays. Love you.